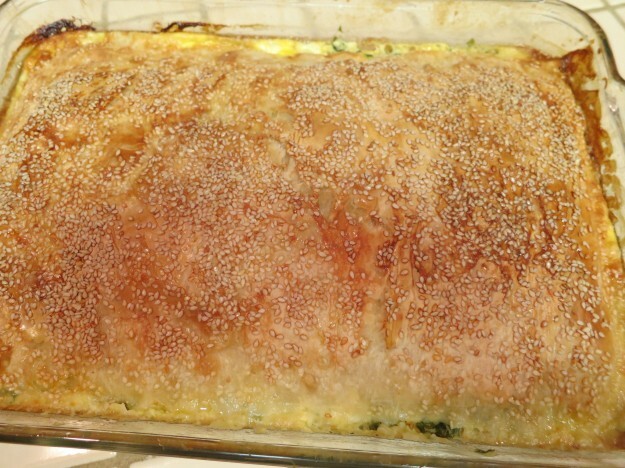 This wonderful pie has to be one of the most deliciously pleasing and easy borek around. If you can get yufka, fresh paper thin fresh pastry sheets, it would be best. Alternatively, filo pastry sheets for this recipe also work well. If frozen, you need to defrost them overnight in the fridge and leave at room temperature about 2 hours before using. I combine the feta cheese with mozzarella in this recipe to make it moister. At home, boreks, savory pastries are a very popular snack with ladies’ tea time gatherings and immensely popular with children too. I remember fondly looking forward to my mother’s tea parties to enjoy these tasty treats, and now my children totally love them anytime of the day. I love our savory pastries in Turkish cuisine; boreks, gozlemes, pogacas and more; there’s a Savory Pastries chapter in my cookery book, Ozlem’s Turkish Table, with all these savoury treats and regional specialties included. 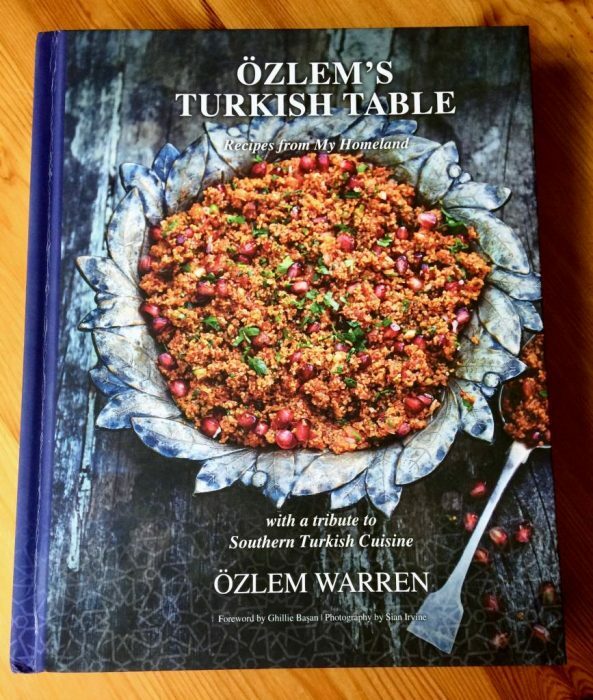 My cookery book, Ozlem’s Turkish Table is available to order at this link and delivered worldwide. 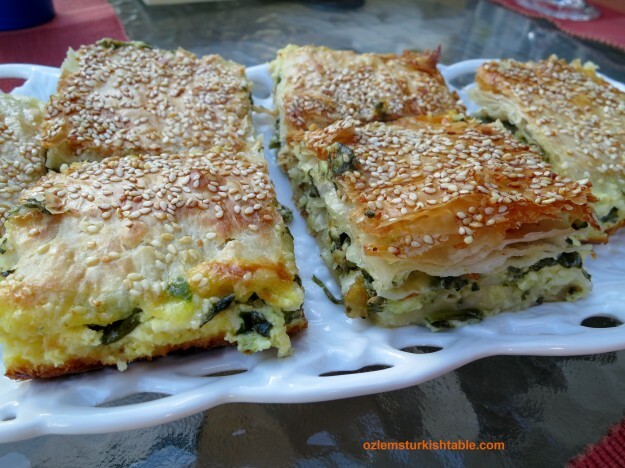 This borek is a great addition to a weekend brunch or a dinner party appetizer, Afiyet Olsun! Remove the stalks of the spinach, wash and chop roughly. Mix together in a bowl with the feta cheese, shredded mozzarella and two of the beaten eggs. In a separate bowl, mix the water, 1 tablespoon olive oil and milk. Grease a rectangular baking dish with the remaining olive oil. Lay the pastry sheets along its long side and cut in half vertically. Open the sheets only when you are ready to use them and cover the rest with a damp towel so that they don’t dry out. Lay three sheets in the greased baking dish. Pour a little of the milk-olive oil-water mixture (about 3 tablespoons) all over the sheet. Repeat this layering two more times, using three fillo sheets each time. Lay three more sheets over and spread the spinach filling evenly. Continue laying three sheets of fillo, pouring over each the milk mixture, three more times. Lay the remaining sheets on the top of the pie, sprinkling the milk mixture. Whisk together the remaining beaten egg with a little olive oil and brush over the pastry. Sprinkle with sesame or nigella seeds. Bake the pie in the oven for about 40 minutes, until the top is golden brown. Serve hot, cut into pieces. This dish can be successfully reheated. Important tips: If you would like to cut back on the amount of the eggs, you can omit or decrease them in the spinach and feta filling. 2) Once cooked, if you keep the pie covered with flax or parchment paper, this will keep the pie moist. 3) This pie freezes wonderfully. Once cooled, put the pie in a freezer bag and seal. When you’d like to reheat (at 350 F for about 15 minutes), put the pie in a greased baking tray and sprinkle the top with a little milk and water mixture to give some moisture. Turkish cuisine is a healthy, delicious cuisine, and we use lots of grains, nuts, olive oil and vegetables. This is one of my favorite mezes of all time; it is very easy to make and very, very more-ish, you just can’t stop eating them. It is one of my mother’s recipes and whenever I make it, I feel like I am home. 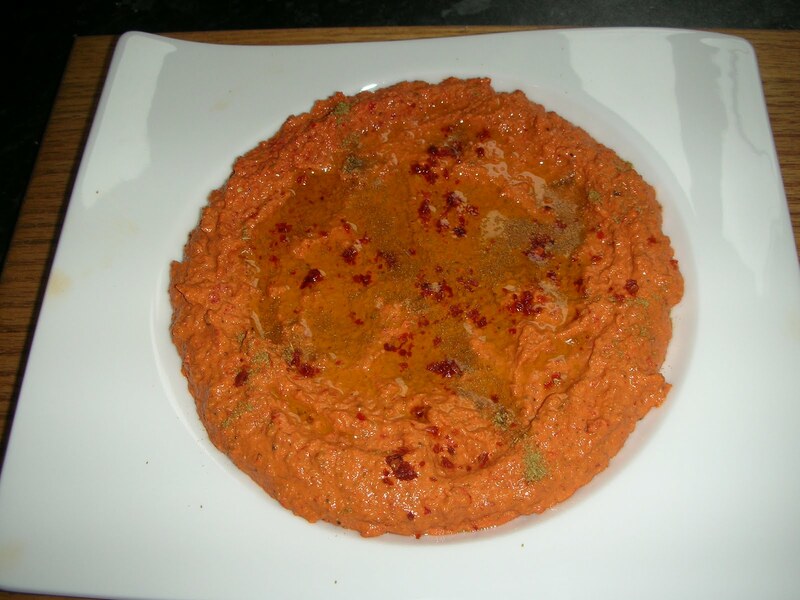 You can find the red pepper paste in specialty stores and in many big supermarkets. Ground the walnuts with the onion, cumin, salt and red pepper paste in the food processor. Soak the bread into water and squeeze the excess water. Crumble the bread and add to the mixture in the food processor. Add the olive oil and water and blend to make a smooth spread. If it appears to be too thick, add a little more olive oil. Place the spread on a small salad plate or bowl. Pour the extra virgin olive oil all over and sprinkle with red pepper flakes. Serve the spread with toasted baguette slices or wide crackers.